In 1968, avant-garde artist Marcel Duchamp and composer John Cage exhibited Reunion, a chess performance that took place in Toronto. Whenever Duchamp or Cage moved a piece, it generated a musical note until the game was transformed into a symphony. Inspired by this performance, Irresponsible Mediums—poet and academic Aaron Tucker’s second full-length collection of poems—translates Duchamp’s chess games into poems using the ChessBard (an app co-created by Tucker and Jody Miller) and in the process, recreates Duchamp’s joyous approach to making art, while also generating startling computer-made poems that blend the analog and digital in strange and surprising combinations. The text includes an introduction from two-time US Women’s Chess Champion Jennifer Shahade (who has performed with Tucker and the ChessBard previously in Toronto and Philadelphia). 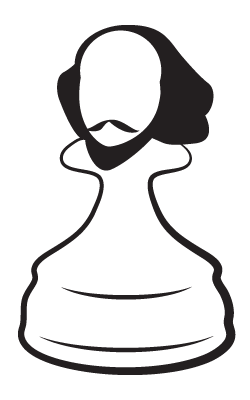 The book also includes three visual chess-pieces by poet and artist Derek Beaulieu. 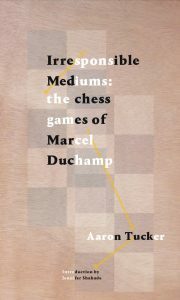 For further thinking and explanation behind the ChessBard visit Tucker’s Poetics Page.